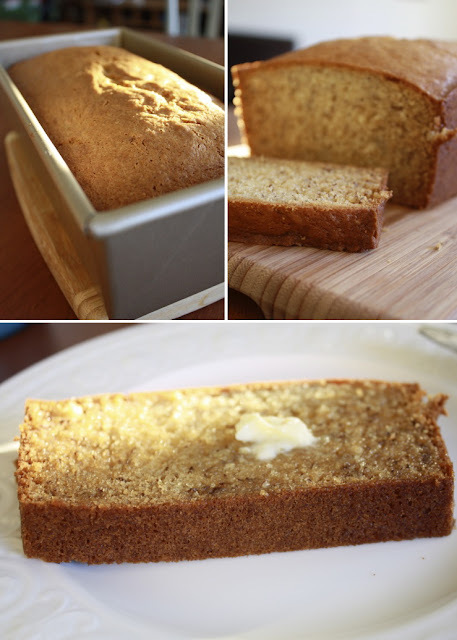 So here is the ridiculously simple recipe for the scrumptious banana bread.... from my friend Brianna's mother, who apparently got the recipe from a 1960's local women's fundraiser cookbook. Cream the butter, sugar and eggs. Add milk, followed by the dry ingredients. In a separate bowl combine mashed bananas and vanilla. Mix the banana mixture into the bread mixture and voila you're done! Grease a bread pan and bake at 350 for 1 hour or until a toothpick comes out clean.